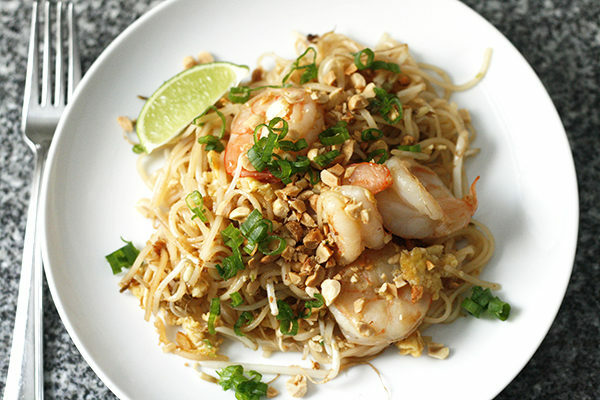 Filled with veggies and a rich sauce that’s lightened with the squeeze of lime at the end, this Pad Thai for Two with Shrimp is a hearty dish with a variety of textures that’s just lovely. I never intended to be a single mother. Does anyone? Perhaps, but for me, that wasn’t something I wanted for myself or my children. And yet, there comes a time when you have to ask yourself if the relationship you’re holding onto for the sake of the kids is worth the pain, discomfort and struggle. Is it actually teaching the kids anything valuable about relationships? In the end, I realized that being miserable in a relationship wasn’t good for my kids — and it certainly wasn’t good for me. So I created a new life for my kids and I filled it with new experiences, fun and laughter. It’s not perfect, but it’s better. With that new life came a new challenge for me … visitation. Every weekend, my kids venture off to see their father and I am — temporarily — just one person. At first, I was so busy that the time was spoken for before it even began. When I was working on Grains as Mains, every weekend was spent testing, retesting, typing and submitting the recipes. The time alone was barely enough to contain the grocery runs, cooking times and other work that needed to be done. Eventually though, the book was submitted and I had to figure out what to do with my life when my kids weren’t there. It was uncomfortable and foreign. After having been the primary — and often sole — caretaker of my kids for so long, I didn’t know how to spend time with myself. But then I did it. I went to concerts alone. I shopped and decorated our house. I read. I binge watched The Walking Dead and Orange is the New Black and other shows that were too old for my kids, but just right for me. And I wrote. Friends visited. I visited them. And I learned to cook just for me. 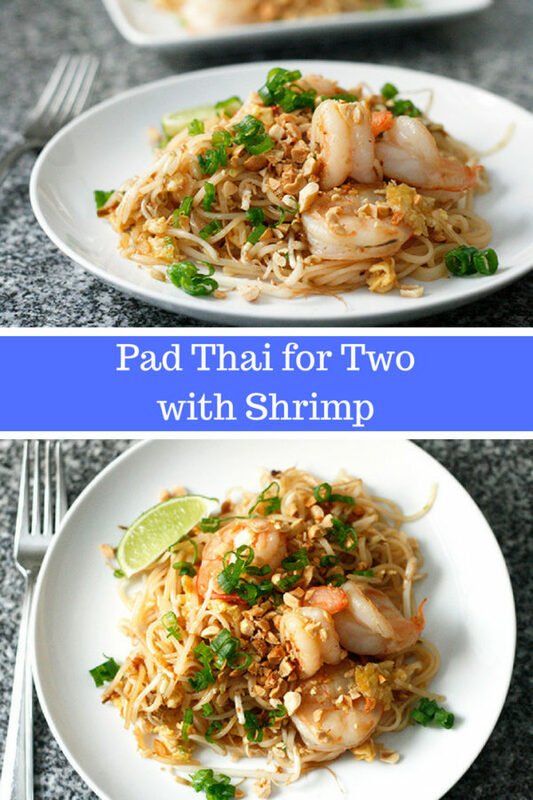 Recipes like this Pad Thai for Two with Shrimp are perfect for when you’re cooking just for yourself or for yourself and one other person. The abbreviated portion size means you won’t have tons of leftovers, and the process — the chopping, mixing and cooking — can be lovely when done to favorite music (may I recommend a side of David Bowie with this?). This is something I can make and enjoy, saving leftovers for an easy lunch another day. 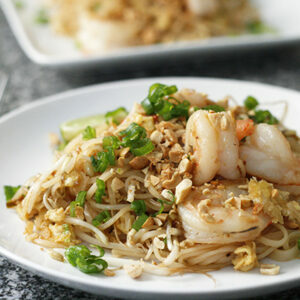 The key to making Pad Thai — whether this recipe or any recipe — is to prepare your ingredients before you begin cooking. This is one of those dishes that cooks quickly and has some speedy steps. Having everything chopped, measured and ready to go makes cooking it a breeze. Filled with veggies and a rich sauce that’s lightened with the squeeze of lime at the end, this pasta dish is made with rice noodles. The shrimp and sprinkle of peanuts give it wonderful texture — and a certain heartiness that’s just lovely. It’s been several years now, and alone time can sometimes be a little much. The truth is that I love companionship and conversation and lazy mornings lingering over coffee and the newspaper or a book with a special someone. And I’m lucky to have had that too. But it’s also okay to be solitary, and immerse yourself in your own thoughts and needs. That’s something I am still learning to enjoy. Cook the rice noodles according to package directions. Drain. Set aside. Heat the olive oil in a large skillet. Add the garlic and white parts of the green onions to the skillet. Cook, stirring, for about 1 minute, until fragrant. 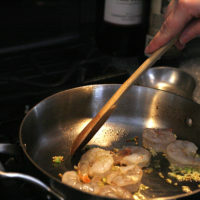 Add the shrimp to the skillet and stir well to combine. Cook for 2-3 minutes until just beginning to turn pink. Add the egg to the skillet. 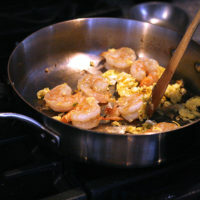 Cook, stirring frequently, until the shrimp are opaque and the eggs are lightly cooked. Remove the skillet from the heat. 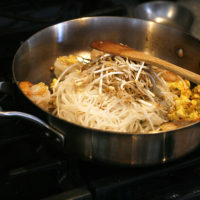 Add the rice noodles and bean sprouts to the skillet and toss to combine. 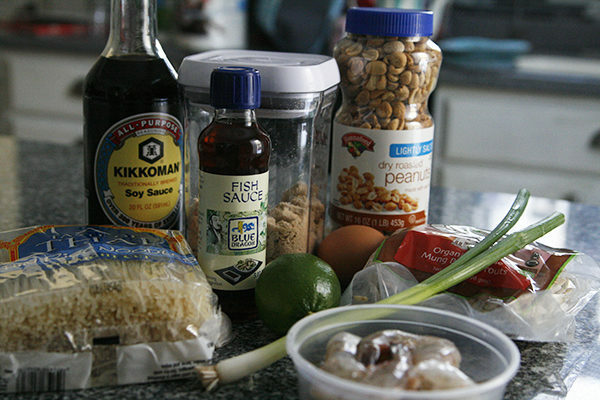 Whisk together the soy sauce, brown sugar and fish sauce. Pour over the rice noodles mixture and toss well. Divide evenly onto two plates. 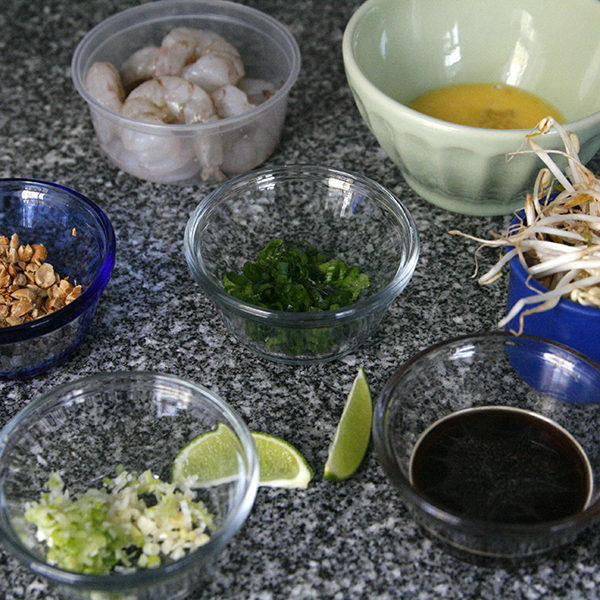 Top each with half of the peanuts and half of the green onions. Serve with lime wedges. What a lovely meal for 2! This is one of hubby’s favorite dishes!!! I’ve always wanted to try it out for him. Thanks for sharing this yummy dish! 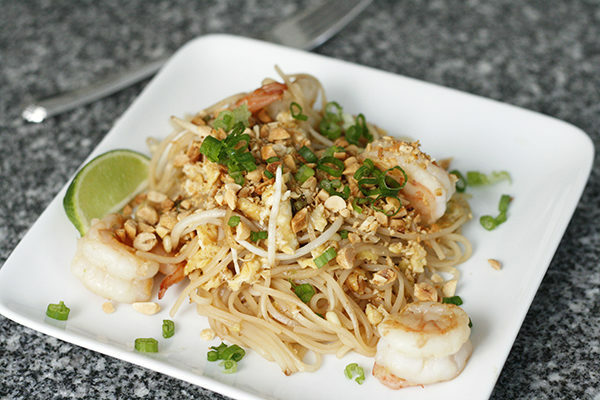 ooooh i love me some pad thai! and with shrimp – perfection! love that i have a recipe now! This has to go on my menu for next week! I’ll have to double the batch. The kids love it, too! It’s not easy to make the decision to go it alone when kids are involved, but being happy and role modeling that for your kids is incredibly important. I’m glad you found what works for you. And I agree – having the ingredients all ready to go make cooking dishes like this so much easier. What a delicious dinner! 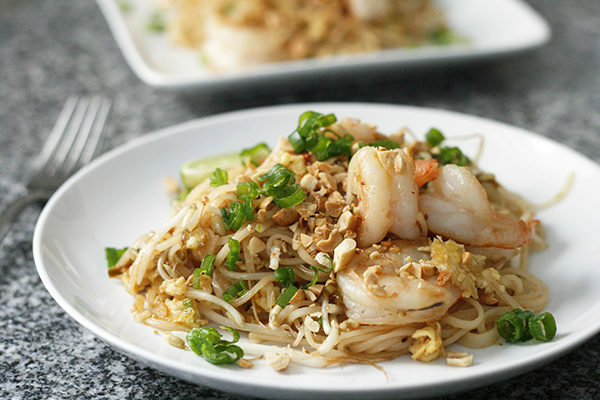 So easy to make at home instead of take-out!